Score the flesh of the fruit to the pit. Make 3 – 5 cuts per plum. Place the fruit into quart jars (Ball or Mason jars work fine). Put as many plums as possible in the jar without bruising the fruit. Add the sugar, cinnamon stick, and lemon peel. Add vodka or EverClear to cover the fruit. Close the jars and seal. Place jars in a waterproof container (I use a 5 gal. bucket). Place the jars in a cool and dark location for about 3 months. Pour the contents through a very fine mesh strainer and/or a coffee filter into another jar or bottle. Mark the bottles as to which base was used for that bottle. Keep the jars/bottles out of light and in a cool area (I keep mine in the refrigerator). 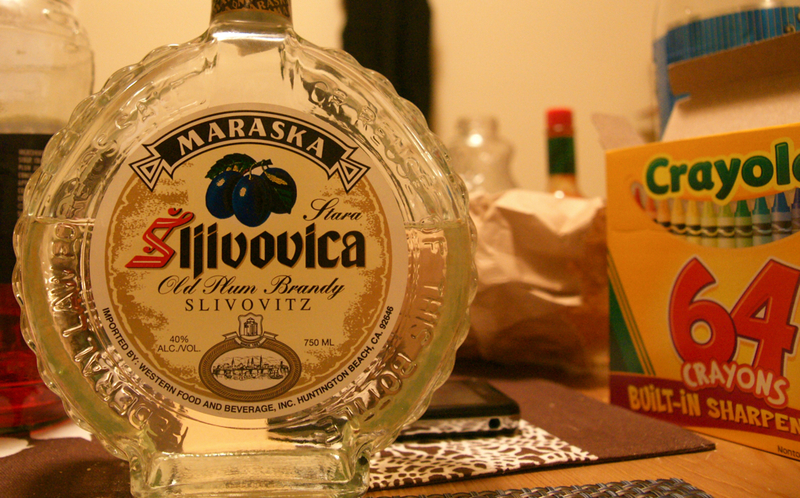 Slivovitz will be sweet without being cloying and will gradually darken as it ages. I currently drinking a batch that I made two years ago and I must admit, it’s drinking rather nicely! !